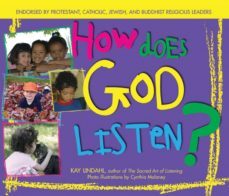 Multicultural, Nondenominational, NonsectarianEndorsed by Protestant, Catholic, Jewish, and Buddhist Religious LeadersPlayfully explores with kids how God listens and how learning to listen is important.How Does God Listen? encourages children to use all of their senses to explore and develop a personal relationship with God. How does God listen? How do we know God is listening to us? Children will find the answers to these questions as they engage their senses while the story unfolds, learning how God listens in the wind, waves, clouds, hot chocolate, perfume, our tears, and our laughter. The simple yet profound text, accompanied by vibrant, colorful photographs, captures the experiences common to children of all faiths and backgrounds as they begin to understand the many ways God listens to us. Filled with wisdom and love, How Does God Listen? delights the senses and expands the ways we think about God and God’s presence in our lives.“How Do I Know that God is listening? I can’t See God.”“Well, there are lots of things we can’t see, yet we know they are there.”How can we know that God listens to us? This lively book helps children use all of their senses to explore how God is always present in their everyday lives, and is always listening. Using simple, everyday examples to which children can relate, How Does God Listen? helps children develop a direct and personal understanding of God. How Does God Listen? teaches children—and the rest of us—that God is everywhere, and that the world is full of wonder.